PayPal allows secure payments to be made from a Credit Card or from your PayPal account. 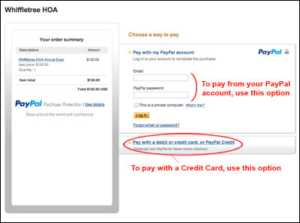 It’s “fast, easy and secure!” Just follow the steps below to pay your Homeowners Association Membership Dues. To pay using your PayPal account, enter your email address and PayPal password in the area that says "HAVE A PAYPAL ACCOUNT?" To pay using your Credit Card, click on "DON"T HAVE A PAYPAL ACCOUNT?" (see screen image below), which will then bring up the screen for filling in the credit card information.